I was nine years old when I started to buy Autocar and CAR magazine regularly (yes, I really was that sad and unchildlike – my mum always says I was born an old man), instantly hooked by the scribblings of such luminaries as Steve Cropley, LJK Setright, Phil Llewellyn, Russell Bulgin, Giles Chapman and James Ruppert, to name but a few. What they, and others, penned in each edition of their respective glossy covered fixes made the world of cars even more alluring and engrossing as I progressed through my teenage years, not chucking away a single copy of anything I bought. When I began my own humble journey into motoring writing last July, I set about making tentative steps to contact some of those who had inspired me, soaking up everything I could in terms of their advice and encouragement. James has been particularly helpful, with months of email and Tweet correspondence maintaining a conduit of thoughts, suggestions and humorous exchanges. Nevertheless, despite this blossoming online relationship, and not a Russian nor Thai bride in sight, I was both delighted and touched to receive a copy of James’ latest book, The German Car Industry – My Part In Its Victory, with a personalised message inside from the author. Sometimes the smallest things really make your day, don’t they? I’ve yet to meet James in the flesh but I have little doubt that to converse with him face to face is much like reading this book. Immediately engaging and thoroughly absorbing, it’s been crafted in such a way that black belts in anorakdom will be gripped as much as those with merely a passing interest in cars and life generally, with a particular focus on the 1980s. As you’re reading it, you can easily imagine being sat in a bar with James as he’s reeling off anecdotes and factual data from his vault-like mind, hanging on his every word as you learn why those crisply styled front-engined Volkswagens of the 1970s looked the way they did, over a growing collection of empty lager bottles. James’ own personal experiences as (and sometimes harsh realities of being) a Sales Executive at Park Lane BMW are cleverly woven into the tapestry of a comprehensive review of what made the German car industry and its cars so great. It warms the hearts of the geeks among us to see cars referred to both as their market place names as well as their internal coding designations: one man’s pagoda-roofed Mercedes SL is another’s W113. In addition, the detail of changes in engine sizes, power figures, suspension arrangements and equipment upgrades on a near model year by model year basis make this a fantastically reliable and thoroughly researched reference guide. The book’s order is elegant and logical in its construction too, with cars from rival Germanic marques sorted by size so as best to compare and contrast the machinery, progressing from the most unassuming of model lines through to those which had their panels hallmarked by an authoritative arrogance as some of the finest cars the world has witnessed. And how many other books have you read with a foreword by the late, great Kenny Everett? For Sale: new for the 2011 model year; witty stories; pithy content; multi-faceted factfile; sporty soft-back covers with black, red and gold high quality gloss finish; Blaupunkt stereo optional; if you know your cars, then this is a must have for your book shelf; a bargain at £12.99 (no offers). 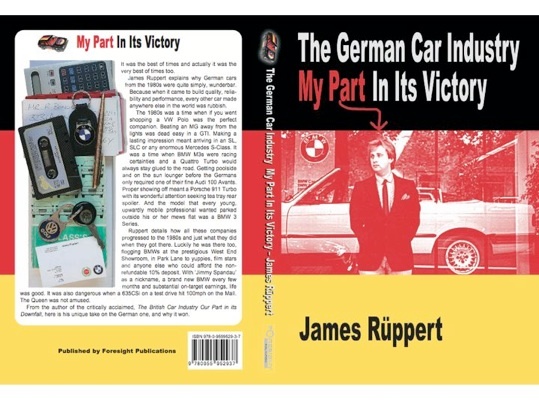 The German Car Industry – My Part In Its Victory is available to buy on James’ Bangernomics website. You can also find James on Twitter as @bangernomics.